Situational awareness: The backing of Sens. 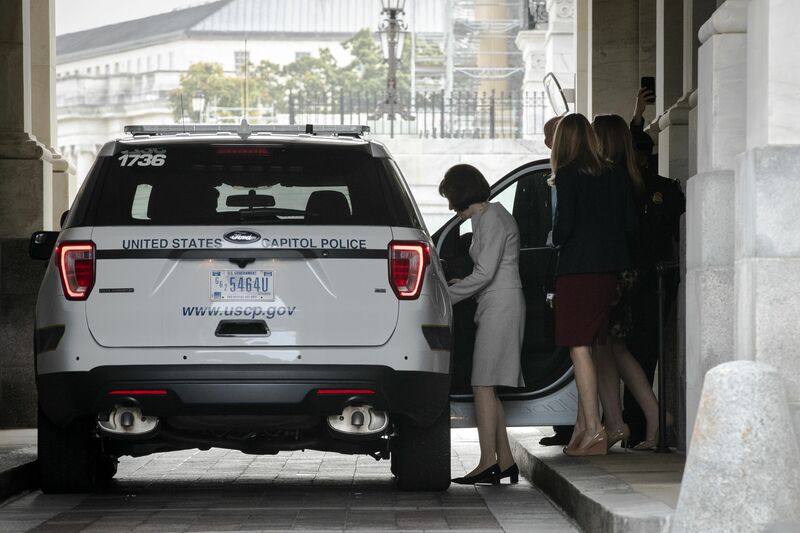 Susan Collins (R-Maine) and Joe Manchin (D-W.Va.) is expected to confirm Brett Kavanaugh for the Supreme Court after a fight for the ages, in a 51-49 final vote today (estimate: 5 p.m. hour). If Brett Kavanaugh is confirmed later today, as looks all but certain, he'll be numerically one-ninth of the Supreme Court. But he'll draw a vastly disproportionate share of attention and speculation, controversy and criticism. 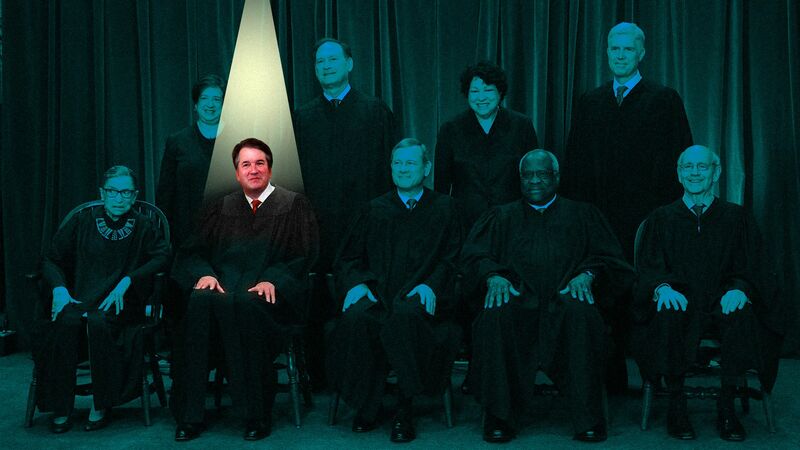 As the decisive vote tipping the justices to the conservative side, he effectively makes this the Kavanaugh Court. "Abortion, affirmative action, campaign finance, gay rights — all those are going to go in a very different direction because Anthony Kennedy is gone and Brett Kavanaugh will be there," legal analyst Jeffrey Toobin said on CNN. Why it matters: Both sides made it clear last night that they plan to keep Kavanaugh in the news for political purposes, deepening and prolonging the most divisive new issue of the Trump era. President Trump was ecstatic last night — very fired up and happy, an aide tells Jonathan Swan. Trump has been briefed on the polling impact — on his own approval rating, and on the "Brett bounce" that is closing enthusiasm gap between Rs and Ds for midterms, 31 days from now. So look for the president to trumpet the win and continue to brag about the Kavanaugh confirmation, as he continues to do about Justice Neil Gorsuch. “It feels like the narrative of what’s going on in 2016," a White House official told Swan. "The reality is probably more mixed." Top Dems tell me that the impeachment of Kavanaugh, however impractical, will be an irresistible applause line for the party's 2020 hopefuls in New Hampshire and Iowa in the months after Nov. 6. Look for Democrats to try to hold off on a Kavanaugh impeachment crusade for the next month, though, to avoid elevating a painful issue for Senate Democrats running in red states. "Trump supporters - The fight isn’t over. You better believe that Democrats are going to do everything in their power to impeach Kavanuagh from the Supreme Court if they take control of Congress in November. This is war. Time to fight. Vote on Nov 6 to protect the Supreme Court!" Andy Surabian, a GOP strategist who ran the Trump Tower war room in 2016, tells us: "[T]o keep the base enthused through November 6th, Republicans must now turn the midterms into a referendum on Democrats attempting to impeach Judge Kavanaugh from the court." "The threat of Democrats impeaching Kavanuagh creates the all-important 'fear of a loss' needed among Republican voters to keep them supercharged for the next five weeks. ... Kavanaugh is rocket fuel to Republican voters." "I expect far-reaching, sweeping decisions. I think they’ll set out to harpoon a bunch of white whales — unions, voting rights, economic regulation." "That'll be like rubbing an open sore. People are going to raise their fist and growl: "Kavanaugh!'" Key quotes from the 45-minute speech by Sen. Susan Collins (R-Maine) on the Senate floor, ending with the words that changed history: "Mr. President, I will vote to confirm Judge Kavanaugh." "[C]ertain fundamental legal principles — about due process, the presumption of innocence, and fairness — do bear on my thinking, and I cannot abandon them." "In evaluating any given claim of misconduct, we will be ill served in the long run if we abandon the presumption of innocence and fairness, tempting though it may be." "We must always remember that it is when passions are most inflamed that fairness is most in jeopardy." The reaction on the right ... You know something rare has happened in the Republican Party when Steve Bannon is gushing over Mitch McConnell — the man he spent months trying to destroy, per Jonathan Swan. In a text message last night, Bannon told Swan: "The fight for Judge Kavanaugh became a proxy fight for Trump's presidency. Senator McConnell showed real leadership and the rest of the Senators real spine. This should stand as a lesson for the future — when Republican band together, stand up for the grassroots and take the fight to the Democrats and the opposition party media, America wins." 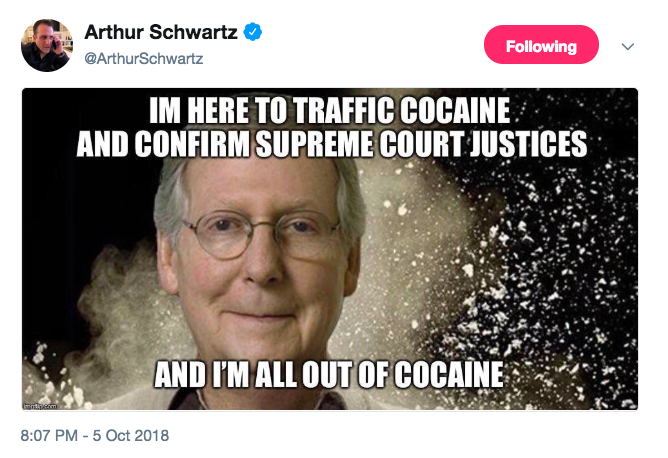 The source — like many others in Trumpworld — appropriated a (debunked) campaign insult (“Cocaine Mitch”) as a mark of newfound respect. 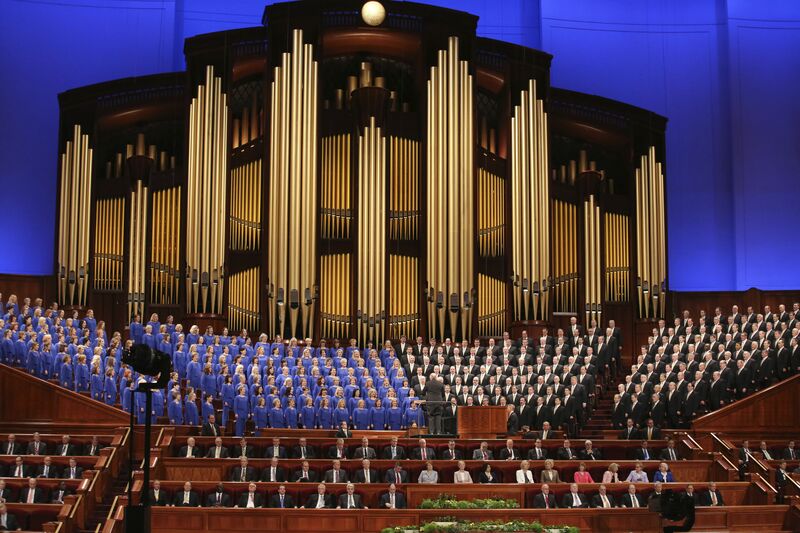 "This weekend, as members of The Church of Jesus Christ of Latter-day Saints gather, ... the beloved musicians sitting beneath the gigantic organ in downtown Salt Lake City’s Conference Center will have a new name ... The Tabernacle Choir at Temple Square." "The change comes in response to church President Russell M. Nelson’s August 2018 edict to use the church’s full name and discontinue using the term 'Mormon' as shorthand for the Utah-based faith and its members." 1) "French police are investigating the disappearance of Interpol chief, Meng Hongwei, who was reported missing after traveling from France to his native China, and they have placed his wife under protection after threats," per Reuters. "Meng’s wife contacted police in Lyon, the French city where the international police agency is based, after not hearing from him since Sept. 25." Why it matters: "[T]he initial working assumption of Western investigators was that Meng had antagonized Chinese authorities in some way and had been detained as a result." "Victor Mallet, a veteran foreign correspondent and author who has run the FT’s news operations in Asia for almost two years, applied to renew his work visa last month but his application was rejected, without any explanation. " "Mallet ... was the acting president [of the Foreign Correspondents’ Club of Hong Kong] in August when the FCC came under attack from Chinese and Hong Kong officials for hosting a talk by the leader of the pro-independence Hong Kong National party." "Could that happen again? Probably not anytime soon, most economists say." "[T]he strength looks likely to endure. There are a record number of open jobs, consumers are confident and economic growth has been brisk." A risk now: "Tariffs tend to elevate inflation by raising costs, which could lead the Fed to step up the pace of its rate increases ... 'a hangover effect.'" Amazon: “Amazon disrupts nearly ­everything it tackles." Oculus: “Facebook’s Oculus unit is nudging virtual reality mainstream." 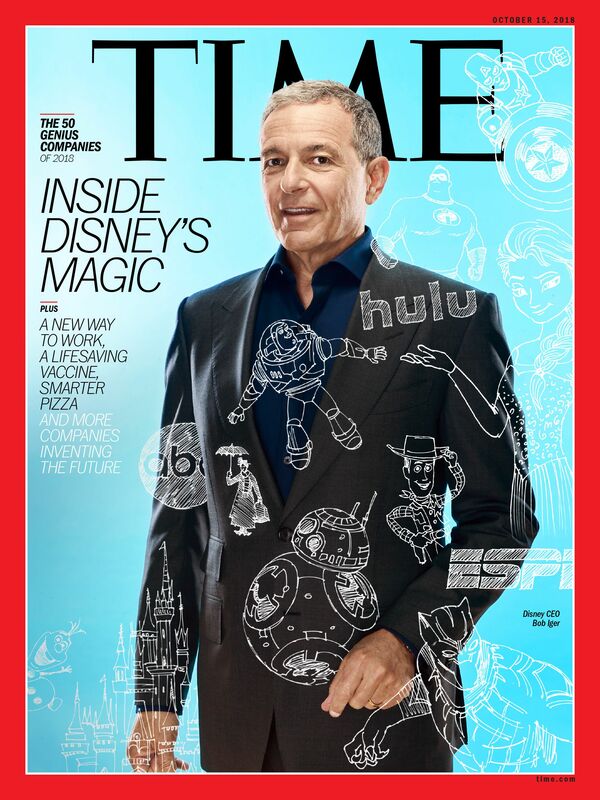 Netflix: “Netflix launched the streaming revolution and turned viewers into binge watchers." WeWork: “WeWork’s vibrant co-working spaces… are transforming office culture." Bumble: “On the Bumble app, heterosexual connections must be initiated by women, which supporters say reduces harassment." Fenty Beauty: “Founded by the singer Rihanna with luxury-goods giant LVMH’s Kendo division ... Makeup enthusiasts rejoiced, not only over the products but also for how Fenty featured women of color in its advertising." 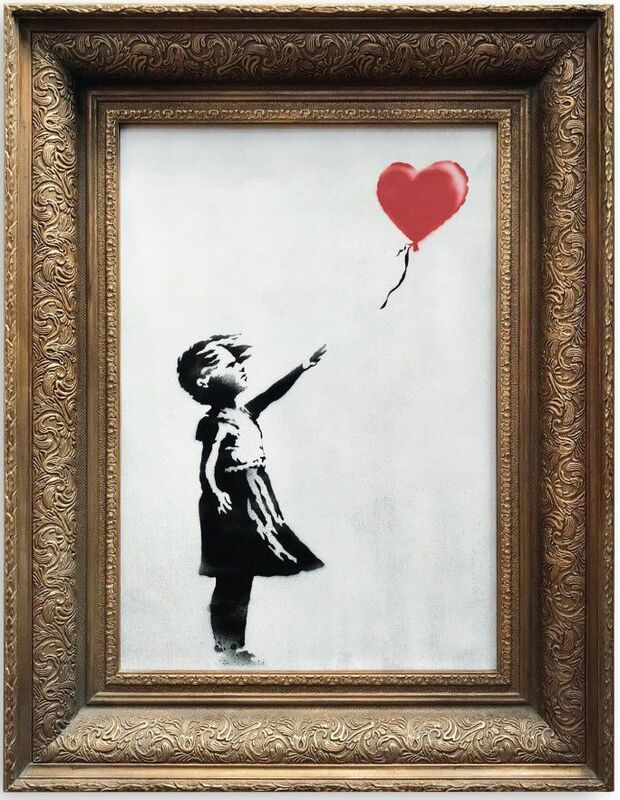 "After the gavel fell [yesterday] at Sotheby's auction house in London, Banksy's 'Girl with Balloon' was reduced to shreds — another apparent act in the disruptive career of the anonymous British graffiti artist." "The framed work, spray paint and acrylic on canvas ... began to pass through a shredder hidden in the frame," according to a Sotheby's release. "It appears we just got Banksy-ed," said Alex Branczik, Sotheby's senior director of contemporary art. Tom Jolly, print editor of the N.Y. Times (a memorable title! ), tweets that Sunday's paper will include a special section reprinting investigative reports about Trump taxes from this week "(Trump Engaged in Suspect Tax Schemes as He Reaped Riches From His Father") and October 2016 ("Trump Tax Records Show He Could Have Avoided Taxes for Nearly Two Decades"). MSNBC Chris Hayes, discussing the muted reaction to this week's exposé, sardonically distilled the 14,000-word story to one word: "Figures!" Smart Brevity: "Trump sought to change his father's will significantly in 1990, sending him a document and instructions to sign it immediately. 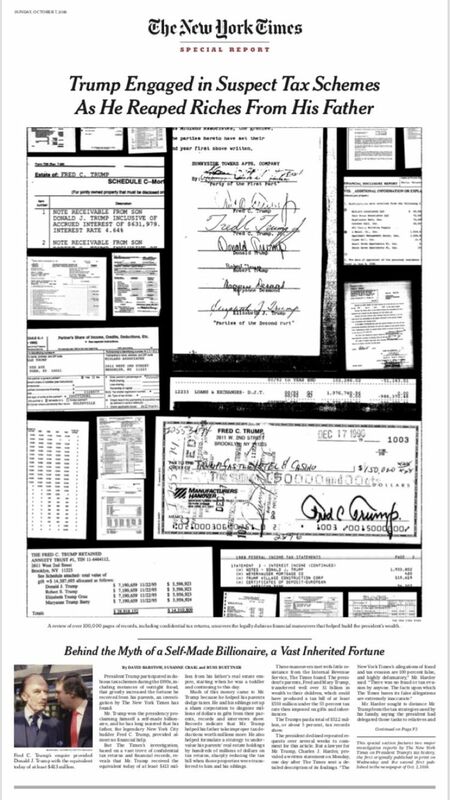 Fred Trump thought the document could put his life's work at risk, and even allow his son to use his businesses as collateral for failing projects." 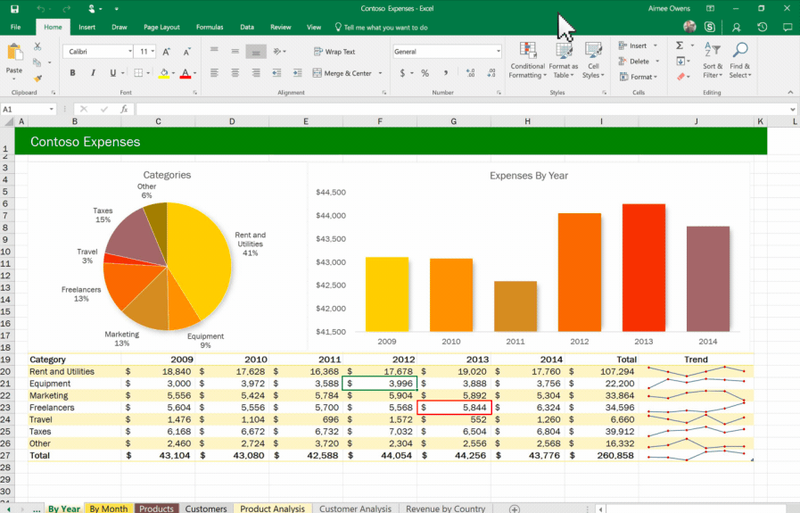 "[T]he spreadsheet program ... has simplified countless office tasks ... At the same time, it has complicated the lives of the office Excel Guy or Gal, ... whose superior skills at writing formula leave them fighting an endless battle against the circular references, merged cells and mangled macros left behind." Andrew Althouse, a 32-year-old statistician at the University of Pittsburgh, was asked from help with "a few Excel sheets" that "turned out to have 400 columns each, replete with mismatched terms and other coding no-nos." "The trouble often starts with a group email asking if there is anyone who knows Excel really well." Colin McIllece, 36, a New York purchasing analyst, "recalls one fiasco where a colleague presented him with a huge document saved into a jumble of folders and teeming with dreaded # symbols, usually an indication of an Excel error."